Craig Meyer has been teaching guitar, bass, trumpet, French horn, banjo, and mandolin since 2001. He has attended Northern Illinois University, Kishwakee Valley College, and Waubonsee Community College. In addition to playing and listening to music he enjoys drawing, painting and spending time with his wife and children. He began his musical career playing trumpet in concert, marching, and jazz band in grade and high school. In high school he also began playing guitar in the school’s jazz band. More recently he has played guitar and been the singer for a rock band. Currently he is working on a solo recording project. 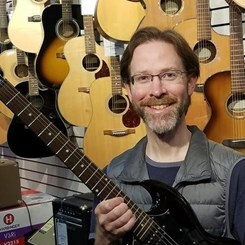 Craig specializes in teaching rock, jazz, blues, classical, and folk music. He believes that each student should strive to be a well-rounded musician, so he focuses his lesson on developing the student’s ear, reading music, improving technical skills, learning lots of songs, and having fun.